Prominent & Leading Manufacturer from Mumbai, we offer battery operated garbage vehicle. Charger - 48 Volt 10 Amp SMPS Fully Automatic With Auto Cut Off. Suspension - Front Hydraulic Shockers and Rear Wheel Spring Leaf. 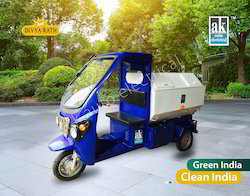 Looking for Divya Rath Battery Operated Garbage Vehicle ?